Behold, the fairly-appropriate Birthday Cake Froot Loops! I mean, I guess they’re alright. It’s a safe bet. Not something I’d sell my first-born child for, but surely a better way to go than making something more specifically Canada-themed. Maple Froot Loops would be bad. 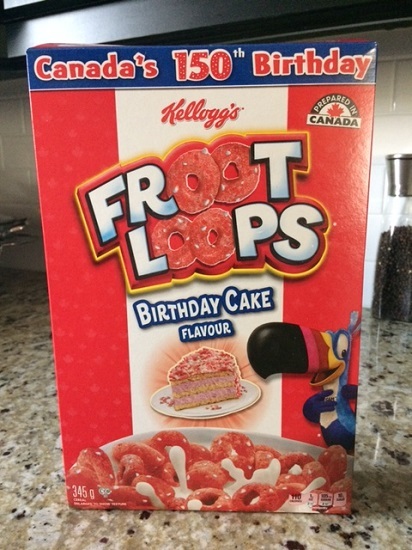 Poutine Froot Loops would be even worse. Froot Loops do not support the same range of gimmick flavours as chips, is what I’m saying. Flavours aside, I do like the simplistic box design. It’s fairly close to the standard F’Loops (Has anyone ever called them F’Loops before? I want credit if it catches on.) box, only with a Canada-inspired white stripe down the middle and a tasteful smattering of festive flair. Very classy, as far as sugary cereal boxes go. The Loops themselves did not quite fare so well. When I puled open the plastic bag in which they resided, my olfactory sense was greeted by a whiff of something mildly unpleasant. I can’t say it was outright offensive, but it did not bode well for a product that expected me to put it in my mouth. There’s a reason why I never eat fish. Upon further reflection, I was able to identify the odor as the typical synthetic birthday cake flavour that is used in other junk foods. Peeps, for example. But it wasn’t quite right here. Party Cake Peeps smell delectable. Birthday Cake Froot Loops, not so much. I can’t put my finger on exactly what about it was off, which I’m sure is not a great help to you, the reader. But I’m also publishing this post a month and a half after the product in question has been pulled from store shelves for the rest of eternity. Clearly, being helpful and timely are not part of my mission statement. The taste of these Froot Loops also left something to be desired. If I continue comparing them to Party Cake Peeps, the Loops tasted like very lightly flavoured cardboard. 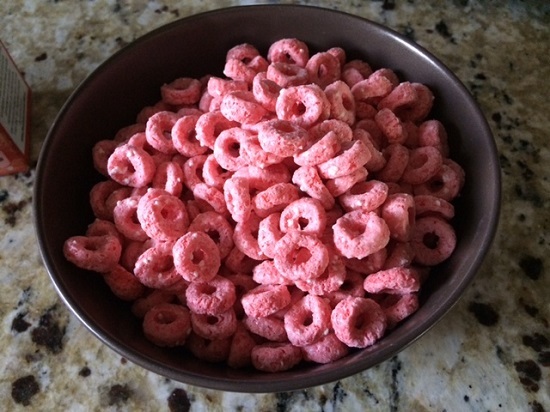 I guess that Froot Loops have just been that way for some time in general, as I can’t recall the last time I actually enjoyed a bowl, but I was still hoping for more from these. It was a long shot, but dreamers gotta dream, you know? They weren’t as bad as, oh, let’s say a certain Cap’n Crunch offshoot, but you can bet your bottom dollar that I never went back for a second box. And so that’s the end of that story. If you found this post underwhelming, don’t worry! I have another cereal-related post in the hopper. Though to be fair, it’s probably not going to be any more exciting. At the very least, it will be more genuine because I won’t be trying to recall the smell and taste of a product that has been out of my mind for weeks upon weeks.